As current home design and interior decorating trends illustrate, minimalism lends many advantages to small spaces related to both functionality and appearance. You might have heard about this lifestyle and decorating approach, and have the desire to incorporate it into your own home, but don’t know where to start. The right strategies can make the difference between merely wanting a minimal living space, and actually achieving it, and that’s what I’d like to discuss. Consider these steps and how they might practically apply to a “less is more” approach in your small space décor. This is the hard part for many people, but minimalism in décor involves making tough decisions on what constitutes clutter (and needs to go), and what stays. Make it easier on yourself by taking down and removing all the décor from the room you want to give a minimal makeover first. Then, one piece at a time, decide what’s most important – a process much easier if you’ve determined the criteria for what makes the cut. What impression do I want to give? What qualities about my life or my family do I want to highlight? Once you have a unified theme, deciding what to keep in the room becomes easier. Choosing not to display all your keepsakes doesn’t mean you can’t keep and cherish them. Rotate them for a fresh look every few months, or repurpose them in unconventional ways in other rooms. For instance, I use a hand-painted vase for cooking utensils in the kitchen. A focal point is the place you want everyone to immediately look when they enter a room – something that draws their eyes like a magnet, for good reasons. What’s most stunning in your room: a painting, a large bay window, a fireplace, a unique piece of furniture? If possible, situate this piece centrally and in the best light, arranging everything else out from it. Test the effect by leaving the room for a few hours and coming back with fresh eyes. Does the focal point draw you in like it should? Doing this leaves you with a naturally cleaner, streamlined look without much effort. There’s a fine line between minimal style in your décor, and an empty, incomplete feeling from taking too many things out of a room. Avoid this line by striving for balance. Think about every piece of furniture, lamp, and decoration as a weight that requires a counterweight. For example, if you have one lamp, you probably need another one, but they don’t necessarily have to be rigidly arranged, or exactly the same. Grouping several small, related items in clusters is another way to create a larger ‘counterweight’ to other elements in the room. Neutral colors in paint, furniture, and main pieces of your room are the best for achieving a truly minimal look, but they don’t have to be boring or limited to grays, black, whites, and beiges (although these are certainly good choices). If you yearn for some subtle color, go for muted pastels such as lavender-gray, rose, or sage green. You may be able to achieve a minimal look with one bold wall, but it requires pairing down everything else and making that your focal point. Within neutrals, choose 3 close shades of one color for borders and accent walls to add depth to the room – a great advantage to small spaces. Choosing furniture in neutral colors within the theme of your room is the first step to giving the impression that your furniture is ‘melting’ into the walls. To make it truly ‘disappear’, choose (or repaint) your largest pieces of furniture in exactly the same shade as your walls. Of course, the less furniture you can manage in a room, the better. Multi-use furniture for small spaces is trending for this very purpose. The placement of furniture can also detract attention from it, if that’s your goal. Keep a clear, open line of sight from adjacent rooms to make them appear larger and more minimally decorated. Lastly, if you need more functional furniture but don’t want it to ruin your look, consider adding futuristic transparent furniture, such as the popular “ghost chairs.” These items add practicality, but are virtually invisible at a glance. 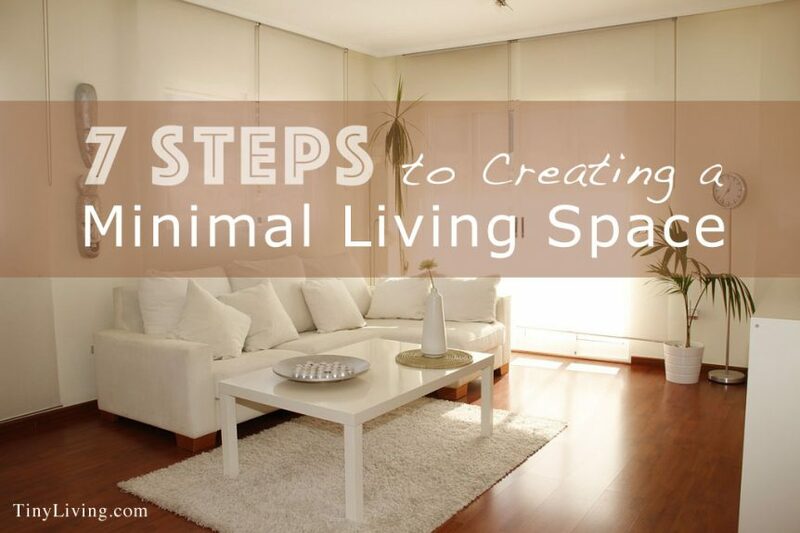 Apply these practical steps for minimalism in your décor, and start discovering even more ideas to maximize its benefits in tiny living spaces.